The Lancashire Witches by William Harrison Ainsworth is recommended in the book (pg 33), as is Villette (232) by Anne Bronte- two books which will add perspective and understanding to the characters, especially when you re-read it (which you will be very compelled to do, probably even right after the first completion of it). If you liked the coming of age aspect of the story, read To Kill a Mockingbird by Harper Lee or Dandelion Wine by Ray Bradbury (both set in nearly the same decade). For a more modern type of story in a journal or letter form, try Sloppy Firsts by Megan McCafferty or The Perks of Being a Wallflower by Stephen Chbosky. For a couple of the discussion questions at the end, and because they share many similar elements and themes, look up The Distant Hours by Kate Morton and Pride and Prejudice by Jane Austen. Twice Cassandra goes to the inn and gets a glass of cherry brandy, her favorite drink: once is on one of her best days on an outing with her sister and the Cotton boys, the second is on one of her lowest when she is depressed over unattainable love. A recipe from a mason jar was chosen because the family is poor, and has very little dinnerware or serve ware, so a vessel, such as a mason jar, that is useful to both cook and serve the food in, seems very appropriate to the Mortmain’s situation in the beginning of the novel. *Note: If you don’t have vanilla bean paste, pure vanilla extract will work just as well on a 1:1 ratio. (4 tsp. bean paste= 4tsp. extract). 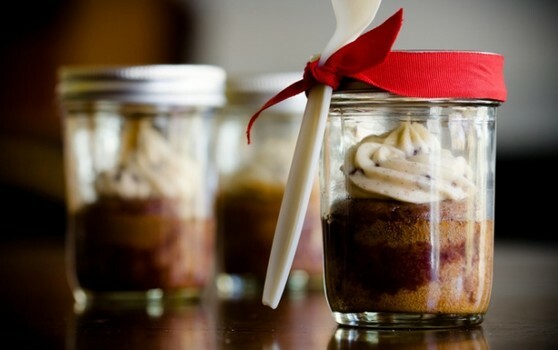 Try to use pure vanilla extract, not imitation, for best results; though imitation will work in a pinch. Combine ingredients in a medium-sized saucepan. Bring to a boil and then reduce heat to medium-low. Use a sieve to strain out the cherries. Reserve both the syrup and cherries. In a medium-sized mixing bowl, whisk flour, baking powder, and baking soda. In another medium-sized bowl, beat butter, sugar, and honey until well combined. Beat eggs and milk into the butter mixture. Alternately fold the flour mixture and 2/3 cup of the cherry syrup into the wet ingredients. Fold in all of the brandied cherries. Scoop ¼ cup of batter into each mason jar. Carefully place the jars in a roasting pan and pour enough hot water up the sides of the pan to 1/2”. Remove from oven and pour 1 tablespoon of cherry syrup into each jar. The cupcake will absorb the syrup. Mix butter and powdered sugar until light and fluffy. Mix in vanilla bean paste and milk until fully combined. Cupcakes should be eaten within two days of baking. We do not promote eating them after two days. 1. Have you ever known anyone like Cassandra’s father, who would “prefer not even to meet his own household”? Were they difficult to get close to or get along with? why or why not? 2. What are some of the humorous elements you remember most from this book? Were there any events or lines that stood out to you, like, “We have missed the ham” (16)? 3. Have you ever wanted to go on looking at the sky, or something in nature, as if it had something it was telling you? What was it you were looking at? What did you feel it saying? 4. Is “contemplation the only luxury that costs nothing” (25)? Or are there more free luxuries you can think of? What are some inexpensive ones (keep in mind, even bubble baths use water, which costs a little money)? 5. Cassandra says “Noble deeds and hot baths are the best cure for depression.” (38) Have you found this to be true, or are you of the mindset that “No good deed goes unpunished”? What are your favorite cures for feeling sad or depressed? (Note: If you have clinical depression, be sure to see a certified mental health professional about it right away. Do not try to treat clinical depression with baths or noble deeds). If you do enjoy long baths, do you agree that “the first few minutes are the best” (49)? Why? 6. Think back to when you were a young girl; do most of their minds turn to wondering about marriage, especially considering most eligible boys their age? Are most of these minds shut to what marriage really means? What is your definition of marriage? 7. Do you remember the first or the last time that you were looked at with eyes “so direct that it was more like being touched than being looked at” (104)? Did it make you feel dizzy like Cassandra, or something else? 8. Have you ever felt so happy about something (an achievement, a goal, a dream, a kiss) that you felt you couldn’t hate anyone? How long did it last? What caused it? 9. Cassandra said she seemed able to write better with the cheaper writing exercise book from Stephen than with the leather-bound book from Simon; do you think that had anything to do with the person who gave them to her? Or do you think she felt intimidated by the prettier book, as if her words had to match the higher level of the tools? Have you ever felt intimidated to do a project you were normally at ease with, because the equipment was suddenly nicer? If so, what was it? 10. Have you ever felt a crossroads feeling in your life as Topaz did? When? What was the decision? How did it turn out? 11. Do you believe people can make things happen with their thoughts or will, or is it just coincidence? Rose thought she did, especially by wishing on the angel. Have you ever had an experience like that, where someone you were thinking of happened to call or visit or you saw them somewhere, or anything like that? Have you ever felt you created an event by wanting it badly enough? 12. Do you ever wonder “if there isn’t a catch about having plenty of money? Does it eventually take the pleasure out of things” (197) because you don’t have to work as hard or wait as long for the things you wish to own? 13. Cassandra talked about not really knowing the feel of a city until you were alone in it. Have you ever been to a new place as part of a group, then by yourself? Did it change the feel for you at all? Explain how. 14. Cassandra notes that her brother Thomas is very educated and knowledgeable, and “can be so appreciative of art, but so matter of fact and unemotional about it.” Is Cassandra better off than him then, since she has chosen the “college of life” to educate her, instead of going to actual college? Which would you prefer? 15. How are Cassandra and Rose similar to Jane Austen’s Elizabeth and Jane Bennet? How are they different? Is one Elizabeth’s conclusion more satisfying than Cassandra’s or not? Why? 16. Read The Distant Hours by Kate Morton. What are the similarities between Raymond Blythe and Mortmain? What are the differences? How do their books compare with each other? Which fictional book would you prefer to read most, “The True Adventures of the Mudman,” “Jacob Wrestling,” or “Enigmatism”? Why? Cassandra says “How long it takes to write the thoughts of a minute!” Do you agree with her or not? Have you ever tried it? • Suggested challenge: Pick a minute, even a busy one, and try writing every thought and its train that tracks along your mind. Have a friend time you, or use your phone or a stopwatch. Look at what you came up with, and share it with the group. Compare the differences and similarities among your styles of writing and individual thoughts. Cassandra also thinks “it really makes one feel rather God-like to turn things a different color.” Have you ever dyed or colored anything like your hair or clothing? • Suggested challenge: Get together with your group and try having a shirt dying, or hair dying (you can also do this at the salon) event (or, if it is near Easter, try coloring eggs), or even a manicuring party and everyone can paint their fingernails and/or toenails. Make sure no one is pressured or forced into coloring anything of great value to them, as results cannot be guaranteed. Or you can just try this yourself, or skip it altogether. Please be careful and follow all instructions on dying applicators if you choose to do this challenge. Do not try it with anyone who has any allergies.